Stealth camper vans are home made camper vans that do not look like a camper van from the outside. This generally means they do not have any windows. People do not add windows to their camper vans to avoid the attention of thieves. I made my own camper van without any windows, and never had a problem with light, ventilation, or crime. Inside my van was as comfortable as any other. The light coming in through the rear doors and through the cab was more than enough, and was never dark during the day. In the absence of a window you can add a roof vent, mushroom vents or even add a fan to the inside of your stealth camper van. Can’t open a window for ventilation. You can fit roof vents though, these are difficult to see. Some campsites don’t allow normal panel vans, i.e. stealth camper vans. Yet, it is a comfortable camper van on the inside. 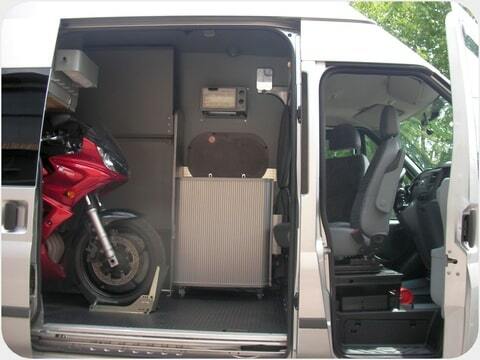 Purchasing a stealth van in the USA. Please help. Thank you. any advise would be much welcome , i want my van to look like it doesn’t have any windows but so i can see out a little ? Have a look at mine! Wow, thanks a great looking van. Well done. I thought I would drop you a line to. Wow that’s a great looking campervan. Where did you get your tambour doors from? Thanks ! Bought these tambour doors in a local campershop. German beand “Rehau”. I am from Hellas and my English are limited.I really envy you in England having all the potencial to own the campervan your heart desires,factory made motorhome or self made camper van with little money.This site is perfect,covering all the parameters that existing vans,allow to.Is it legal there to own a bus like Toyota coaster not for proffesional use and without having pro licence of school bus and most of all to convert it to camper.And the licence from ministry of transportation etc.Or to own a 6.94 m panel van for private use and conversion later?Why there aren’t in europe any Japanese vans or mini bus equiped with auto gearbox that always work for more than 400000km? and the van and motorhome market is allowed to be dominated by Ducato that has euro 4 emissions still,needs 3000cc engine to stand an auto that may not like cold,leak water when rain,need oil adding(unbelievable with my Toyota of 500000km),and aerodynamic cda low.Why we haven’t seen any conversions of the new opel movano 6.90 m long with auto gearbox.That would be i think the mother of all european based campervans especially if you used ready cut non toxic plastic inside instead of that damn wood that makes camper look like wardrobe inside,make noise and can’t be cleaned.A camper van especially has no reason not to be made like a tank,outside and inside and feel like made by hightech robotised automobile factory.Those facilities that produce ready made motorhomes are not factories i think,just big carpender hangars that sell from 50000 to 200000 euros and like to put their own badge as well on the vehicle.Thank you. does anyone know a good company in the South West of France to hire camper vans from or at least near the area? That’s a great looking stealth camper Andy Very stylish, individual and well kitted out. Upload attachment (Allowed file types: jpg, gif, png, pdf, maximum file size: 24MB. A nice book about Sprinter camper / work van conversion. CampervanLife is a community website celebrating all things campervans. It is run by Darren Lambert, a campervan van fan and converter.